Findagrave.com, memorial #23689754. Photo by Marc Ryan. Property 23 Apr 1705, Wallingford, CT To obtain a clear idea of how these disputes arose, it will be in order to mention the case of William and Mary Tyler. It appears that on the 23d of April, 1705, they sold "102 akers" of Second Division land "called the Lothrop farm," lying one mile from the New Haven Mill river and "eight acres" adjoining "layed" out on the east side of this farm. It was well understood at the time, that William and Mary Tyler did not convey a "Proprietor's right" in selling this land. It was only a small portion of the land that had belonged to some of the numerous Lothrop heirs and the title by which it passed into the possession of the new purchaser is clearly set forth by the vote taken ten months later. "Att an ajurned town meeting the ninth January, 1706-07, the town admeated Thomas Broox an inhabetant upon thatt land he purchest." [S927] Vital Records of New Haven, 1649–1850, 50, Thomas Brooks b. [S703] Jean McKee, BROOKS-NE-L posting of 7 Dec 2002. [S696] Donald Lines Jacobus, Ancient New Haven, 2:336, Fam. 2, Thomas 1. [S927] New Haven VR, 91, Thomas Brooks/martha Hotchkif m.
[S1461] Jacquelyn Ladd Ricker, The Ricker Compilation, Wallingford VR, Thomas Brooks d. New Cheshire. 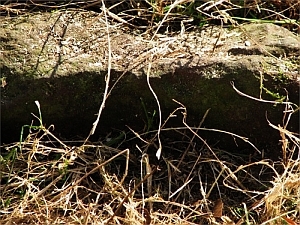 [S53] Gravestone, recorded October 2002. [S1009] Joseph Perkins Beach, History of Cheshire, Connecticut, 47-48. [S1121] Public Records of the Colony of Connecticut, 1636-1776, 6:521, 7:348. [S1121] Public Records of the Colony of Connecticut, 1636-1776, 6:521. [S1121] Public Records of the Colony of Connecticut, 1636-1776, 7:348. [S1461] Ricker Compilation, Wallingford VR, Stephen Brooks b. [S1461] Ricker Compilation, Wallingford VR, Mary Brooks b. [S1461] Ricker Compilation, Wallingford VR, Thomas Brooks b. [S1461] Ricker Compilation, Wallingford VR, Enos Brooks b. [S1461] Ricker Compilation, Wallingford VR, Cornelius Brooks b. [S1461] Ricker Compilation, Wallingford VR, Martha Brooks b. [S1461] Ricker Compilation, Wallingford VR, Mathittabel Brooks b. [S696] Jacobus, Ancient New Haven, 2:336–37, Fam. 2, Thomas 1, Sarah viii. [S1461] Ricker Compilation, Wallingford VR, Benjamine Brooks b. [S1461] Ricker Compilation, Wallingford VR, Henry Brooks b. [S1461] Ricker Compilation, Wallingford VR, Thankfull Brooks b. [S1461] Jacquelyn Ladd Ricker, The Ricker Compilation, New Haven VR, Sarah Brooks b. [S696] Donald Lines Jacobus, Ancient New Haven, 2:336, Fam. 1, Sarah 4. [S1408] Jack Russell Brooks, Silas Brooks, 28. [S927] Vital Records of New Haven, 1649–1850, 91, Thomas Brooks/martha Hotchkif m.
[S703] Jean McKee, transcribing Wallingford Deeds, 14:225-226. Findagrave.com, memorial #9712939. Photo by DMitesser9999, copied by Marc Ryan from Ancestry.com. [S1461] Jacquelyn Ladd Ricker, The Ricker Compilation, Wallingford VR, Stephen Brooks b. [S696] Donald Lines Jacobus, Ancient New Haven, 2:336, Fam. 2, Thomas 1, Stephen i. [S1461] Ricker Compilation, Wallingford VR, Stephen Brooks/Hannah Barnes m.
[S1461] Ricker Compilation, Wallingford VR, Hannah Brooks b. [S696] Jacobus, Ancient New Haven, 2:337, Fam. 3, Jonathan 3. [S1461] Ricker Compilation, Wallingford VR, Jerusha Brooks b. [S1461] Ricker Compilation, Wallingford VR, Lois Brooks b. [S1461] Ricker Compilation, Wallingford VR, Abraham Brooks b. [S1461] Jacquelyn Ladd Ricker, The Ricker Compilation, Wallingford VR, Mary Brooks b. [S696] Donald Lines Jacobus, Ancient New Haven, 2:336, Fam. 2, Thomas 1, Mary ii. [S1527] Sue Phillips Schultz, citing Parson Hall's baptism records. [S1461] Ricker Compilation, Wallingford VR, Mary Brooks/Nathaniel Bunill m.
[S1461] Ricker Compilation, Wallingford VR, Ens. Nathaniell Bunnell d.
[S1461] Ricker Compilation, Wallingford VR, Patience Bunnell b. [S1461] Ricker Compilation, Wallingford VR, Hezekiah Bunnell b., d.
[S1461] Ricker Compilation, Wallingford VR, Rachel Bunnell b. [S1461] Ricker Compilation, Wallingford VR, Rebeca Bunnell b. [S1461] Ricker Compilation, Wallingford VR, Stephen Bunnell b. [S1461] Jacquelyn Ladd Ricker, The Ricker Compilation, Wallingford VR, Thomas Brooks b. [S696] Donald Lines Jacobus, Ancient New Haven, 2:336, Fam. 2, Thomas 1, Thomas iii. [S1461] Ricker Compilation, Wallingford VR, Thomas Brooks/Desire Bristol m.
[S1461] Ricker Compilation, Wallingford VR, Desire Brooks d.
[S1461] Ricker Compilation, Wallingford VR, Thomas Brooks/Elesabeth Bristoll m.
[S1121] Public Records of the Colony of Connecticut, 1636-1776, 11:373. [S1461] Ricker Compilation, Wallingford VR, David Brooks b.; d.
[S1461] Ricker Compilation, Wallingford VR, Joshua Brooks b. [S696] Jacobus, Ancient New Haven, 2:337–38, Fam. 4, Deborah 4. [S1461] Ricker Compilation, Wallingford VR, David Brooks b. [S1461] Ricker Compilation, Wallingford VR, Samuel Brooks b. [S1461] Ricker Compilation, Wallingford VR, Desire Brooks b. [S1461] Ricker Compilation, Wallingford VR, Mary Brooks b.; d.
[S696] Jacobus, Ancient New Haven, 2:339, Fam. 4, Jonathan 10. [S1461] Ricker Compilation, Wallingford VR, Isaac Brooks b. [S1461] Ricker Compilation, Wallingford VR, Gideon Brooks b. Front view of the (much-enlarged) house of Capt. 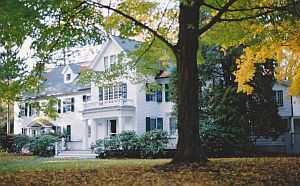 Enos Brooks, Cheshire, CT. Today owned and occupied by Jean McKee, a 4th great-granddaughter, the house has been continuously occupied by a descendant since its builder's death. Photo by Carol Piacentini. [S1461] Jacquelyn Ladd Ricker, The Ricker Compilation, Wallingford VR, Enos Brooks b. [S696] Donald Lines Jacobus, Ancient New Haven, 2:336, Fam. 2, Thomas 1, Enos iv. [S1461] Ricker Compilation, Wallingford VR, Enos Brooks/Tamar Woster m.
[S901] Charles J. Hoadly, Public Records of the Colony of Connecticut, 1751-1757, 10:8. [S901] Hoadly, Public Records of the Colony of Connecticut, 1751-1757, 11:373. [S1121] Public Records of the Colony of Connecticut, 1636-1776, 10:241, 291, 327, 335, 353, 397, 406, 458, 469; 11:173, 213, 220; 12:242. [S1121] Public Records of the Colony of Connecticut, 1636-1776, 10:447. [S1461] Ricker Compilation, Wallingford VR, Capt. 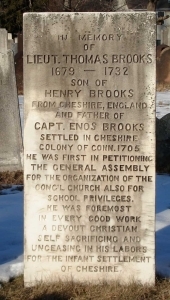 Enos Brooks d.
[S148] FindAGrave.com, memorials #20237773, #28028940. [S703] Jean McKee, BROOKS-NE-L posts of 20 Nov and 7 Dec 2002. [S1461] Ricker Compilation, Wallingford VR, Mahitabel Brooks b. [S696] Jacobus, Ancient New Haven, 2:340, Fam. 5, David 4. [S1461] Ricker Compilation, Wallingford VR, Tamer Brooks b.